We are currently petitioning Bucks County Museum trust to allow an exhibition to commemorate Friars 50th birthday in 2019 following on from the successful exhibition in 2014. Presently they have declined. An online petition has been set up to campaign for a reversal of this decision. Full details can be found here. Inspired by their anger over The Troubles in Northern Ireland and declaring that they wanted an ‘alternative Ulster’ for the youth of their country they let it all out on stage with high energy performances that no one will ever forget. They still have that same energy throughout their set and particularly on their iconic anthems ‘Suspect Device’ and ‘Alternative Ulster’. Following that first FA gig in 1978 SLF were immediately booked back at Friars headlining on 3 Feb 1979 on the Rough Trade Records package which included Robert Rental & The Normal and Essential Logic which was followed by another 6 Friars shows in June ’79, July ’80, May ’81, January ’82, November ‘82 and finally in October 2009. In July 1980 they wanted to put out a live album and decided to record their London Rainbow show on 20 July and the Friars show on 25 July. When they listened to the tapes they decided to take all but one of the tracks from the Friars show as it was so much better. The resulting Live album was ‘Hanx’ which was released later that same year. In November 1982 they were supported by a band called The Wingnuts which no one knew anything about except that they were American. The Wingnuts were due on stage at 8.45pm but at 8.30pm still hadn’t shown up. David Stopps went up to Jake Burns and asked him if he knew where they were. Jake said “They always turn up late…we’ve agreed that they can use our gear” Sure enough at 8.45pm they did turn up in these crazy wigs and Stopps announced them as instructed “….from Cinncinnati Ohio….The Wingnuts!” It was only half way through the first song which was Mud’s ‘Tigerfeet’ that we all realised they were SLF in disguise. That same night Tom Robinson turned up and joined them for the final encore which was ‘2-4-6-8 Motorway’. But that’s not all! Special Guests will be the legendary Eddie & The Hot Rods who first played Friars in February 1976 followed by 4 more headline Friars appearances in October ‘76, February ‘78 (supported by Squeeze with Jools Holland), March ‘79 and October 2010 at the Waterside as special guests to Buzzcocks. They were so good at that first Friars Phase Four Waterside gig ending with their iconic version of ‘Gloria’ and their trademark ’Do Anything You Wanna Do’, that they almost stole the show. 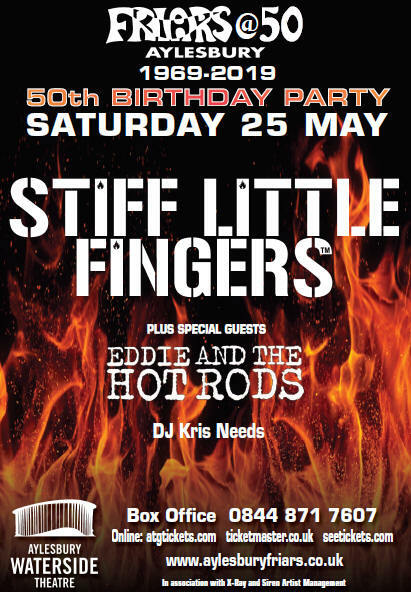 Its totally fitting that SLF and Eddie & The Hot Rods will be playing the Friars Aylesbury 50th Birthday Party and its bound to be one of the most exciting Friars gigs ever. performing Abbey Road in its entirety and other Beatles classics on 26 September 2019 – the 50th anniversary of the release of the Abbey Road album. Friars Aylesbury has a long tradition of supporting local bands and over the years has supported and presented Marillion, John Otway, Howard Jones, Callow Saints and many others. In its 50th anniversary year Friars now presents Aylesbury heroes The Dung Beatles who are considered to be one of the very best Beatles bands in the UK. They will be playing the Abbey Road album in its entirety, plus other Beatles classics. This gig will be on Thursday 26 September 2019 which will be 50th anniversary, to the day, of the release of the Abbey Road album. Formed in 2013 and featuring Steve Hillier (rhythm guitar and vocals), Danny Prendergast (lead guitar and vocals), Mike Ashton (drums), Phil Toler (bass guitar and vocals) and Martin Kent (keyboards) the DBs have been building a solid fanbase throughout Buckinghamshire, Hertfordshire and Oxfordshire. They have sold out many local venues including Aylesbury’s Limelight Theatre, St Mary’s Church, The Elgiva Theatre in Chesham and the Thame Theatre. They have also played The Cavern in Liverpool. This will be the DBs second Friars Aylesbury gig as they played at the Earthly MessengerUnveiling Concert at The Waterside on 25 March 2018 alongside John Otway, Howard Jones and Marillion. They went down an absolute storm that night. That concert included an international audience many of whom had flown in to attend the unveiling. This 26 September Friars concert will be the biggest concert of their career so far. Big fans themselves, the DBs focus on playing the Beatles’ songs with as much love and feel as possible, from the tenderest ballad to the raunchiest rocker, combining well known classics and more obscure album gems. Dung Beatles will be augmented on stage by horn section the Hornettes who are Andrew Dimond (saxophone), Kathy Gifford (trumpet), Michele Toler (saxophone & flute) and Toby Whiffin (trombone). Last remaining tickets available from the Waterside Box Office and simultaneously on line from www.atgtickets.com or from Ticketmaster at www.ticketmaster.co,uk Tickets will be limited to a maximum of 4 per person. Circle seats only available from www.atgtickets.com. Minimum age 16 for standing tickets. No age restriction for circle seats. Friars has presented Nick Mason only once before when it presented Pink Floyd on 9 November 1969. 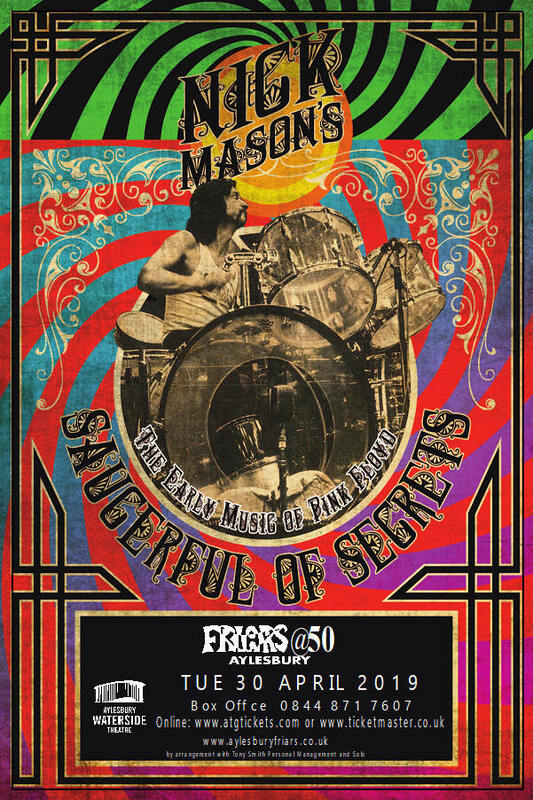 Now, almost 50 years later Friars will present Nick Mason again mostly playing material from the first two classic Pink Floyd albums ‘The Piper at the Gates of Dawn’ and ‘A Saucerful of Secrets’. Having played four intimate and acclaimed live shows at London’s Dingwalls and Half Moon Putney in May, Nick Mason’s Saucerful Of Secrets toured their unique live set of early Pink Floyd across Europe, including six shows in the UK. The tickets sold out almost immediately so the five new shows have been announced including the Friars date. Nick Mason kindly allowed Friars to exhibit his 1969 ‘Waves’ drum kit in the 2014 Friars Exhibition which took place at the Buckinghamshire County Museum. 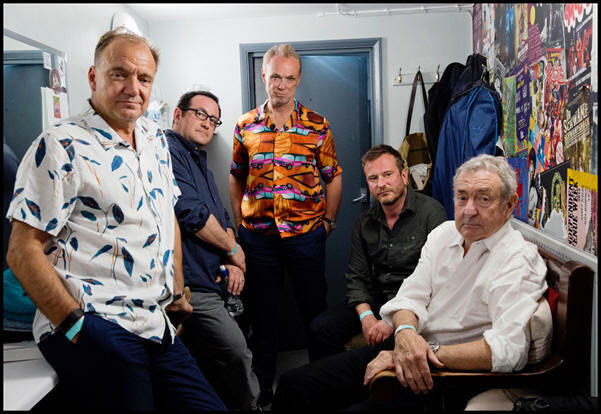 Nick Mason’s Saucerful Of Secrets are Nick Mason, Gary Kemp (Spandau Ballet), Guy Pratt (Pink Floyd), Lee Harris and Dom Beken. 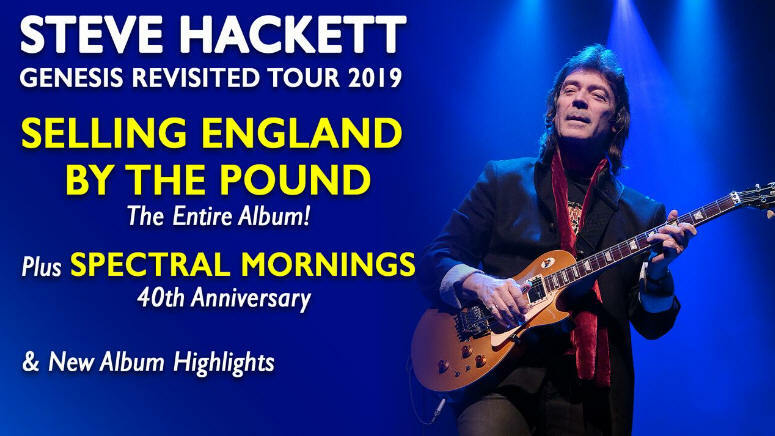 Friars Aylesbury is over the moon to confirm that Steve Hackett will be playing as part of Friars Aylesbury’s 50th Year celebrations, on 2 November 2019. Remaining tickets on sale now from the Waterside Box Office in person, Online www.atgtickets.com or by telephone 0844 8717 607. For the first time ever, Steve will perform the seminal Genesis album ‘Selling England By The Pound’ in its entirety. Released in 1973, the album went to No.3 in the UK charts and has been described as ‘the definitive Genesis album’. It includes such favourites as ‘Dancing With The Moonlight’, ‘Firth Of Fifth’, ‘Cinema Show’ and, of course, ‘I Know What I Like (In Your Wardrobe)’. Other favourite classic Genesis tracks will also feature in the show. 2019 also marks the 40th anniversary of one of Steve’s most popular solo albums Spectral Mornings and Steve will rightly celebrate this milestone by performing some of the masterpieces from this album. Joining Steve on this tour are Roger King (keyboards), Gary O’Toole (drums/percussion), Rob Townsend (saxes/flute), Jonas Reingold (bass/twelve string) and Nad Sylvan on vocals. 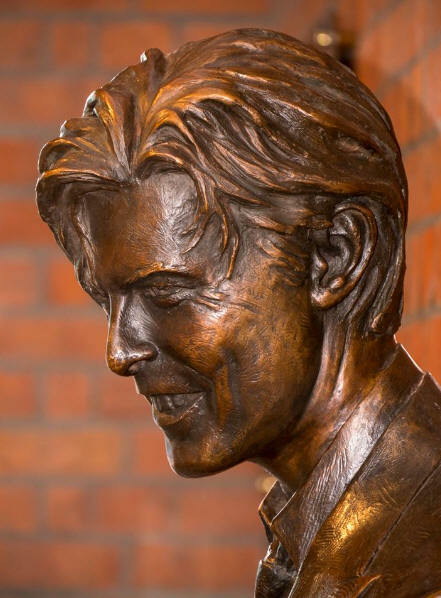 The statue was unveiled on Sunday March 25th to a large crowd, a large audience watching live online and covered by local and national media. This was followed by an amazing gig featuring local heroes Marillion, Howard Jones, John Otway and the Dung Beatles. If you are in the Aylesbury area you can also purchase the book from Rocky & Kook or Aylesbury Music, both in Temple Street, Aylesbury or Deco Audio/Vicious Squirrel in Kempson Close, Aylesbury (Avoids P&P charges).